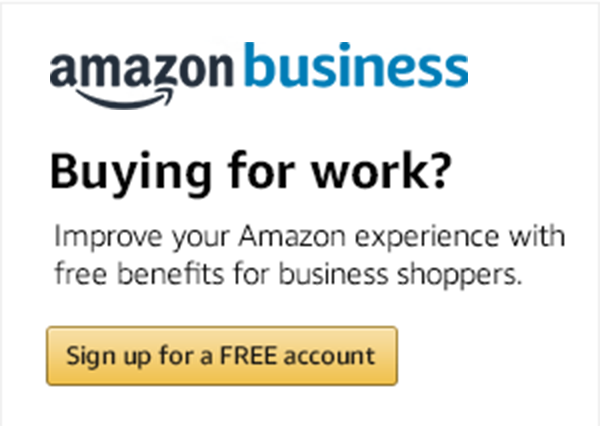 After you have completed your Amazon Business account registration and been verified, you’ll notice a few changes to the look and feel of your Amazon experience, which is designed to streamline your purchasing process. Here are a few tips to help you get familiar with your new account. If you completed the registration process for your organization, you are automatically set up as the account Administrator. You’ll be able to manage purchases for your organization, invite others to join your business account and assign purchasing permissions for invited business users. Each user can have multiple roles—Administrator, Requisitioner or both. A user assigned as a Requisitioner can place orders on behalf of the business. Your Account: Click to view standard Amazon account information, including payment options and delivery addresses. Manage Your Business: This Administrators-only tab helps you manage business account settings, add users, set up groups, manage shared payment methods, create workflow approval chains and more. Approve Orders: If you have workflow approvals enabled, you can view and take action on pending orders from this tab. Orders: View and track orders you have placed on behalf of your organization. If you are an Administrator, you can view all orders. Business Analytics: Amazon Business Analytics is a new reporting tool for business customers. This feature lets you view your company’s spending with dynamic charts and data tables. Recurring Deliveries: Get essential items for your business delivered automatically, based on a schedule you set. Recurring deliveries are always shipped for free, and you can cancel anytime. Manage your recurring deliveries from this tab. Business users can enter a Purchase Order (PO) number or shipment description during the checkout process to help reference packages and simplify order management. A reference ID can display on a shipping label or packing slip, depending on the carrier. An order’s reference ID will also display in your Order History Reports in Amazon Business Analytics. Aggregate your purchases into reports to compare and track spend over time: You’ll have access to several downloadable reports: Orders, Items, Refunds, Returns and Reconciliation. Administrators can download reports for all orders placed on behalf of the business. Requisitioners can download reports for their own orders. Organize data by applying additional filters: Drill down into spend from specific account groups, account users or spend towards specific product categories or seller credentials. Use the table view to get details behind graphical summaries: Compare how you are spending toward certain product categories on Amazon Business. Manage columns to select and unselect specific report filters. Customize the table view to reflect only desired attributes: Tailor reports with attributes that are important to you. For example, if you’re only interested in Payment and Shipment information, you can unselect the other fields. Build report templates: Create and save report templates to simplify future reporting. For more information about managing your Amazon Business account, visit the help center or contact Amazon Business customer service.